WASHINGTON — After more than four months of intense urban battles and coalition airstrikes, U.S.-backed fighters claim they have liberated ISIS’ de facto capital of Raqqa, Syria. 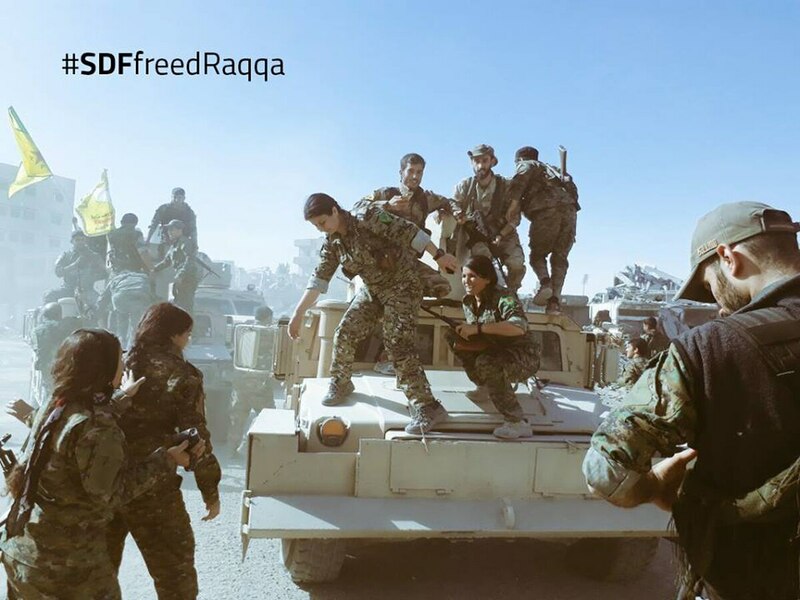 Syrian Democratic Forces, or SDF, fighters took to social media to celebrate the liberation of the city. Multiple factions within the SDF including the Kurdish People’s Protection Units and the Syriac Military Council also announced the populous city had been captured from ISIS. ISIS is on the “verge of a devastating defeat,” in Raqqa, Col. Ryan Dillon, the spokesperson for Operation Inherent Resolve, told reporters at a televised press briefing at the Pentagon on Tuesday. However, officials in Baghdad claim there are still pockets of ISIS fighters numbering roughly hundred that still need to be cleared. According to Dillon, more than 90 percent of the city has been cleared. Dillon said the coalition was aware of reports the city had been liberated by the SDF, but clearance operations continue, he said. Operations to capture the remnants of the city to include the national hospital and stadium accelerated after an SDF brokered deal on Saturday allowed hundreds of ISIS fighters and civilians to leave the city by bus convoy. The coalition was not involved in those deliberations, according to a press release from OIR. The deal was designed to minimize civilian casualties. Since the deal was brokered the coalition has not seen much fighting, but U.S. officials “expect pockets of fighters,” Dillon said. There is still much work to be done in a post-ISIS Raqqa, Dillon told reporters on Tuesday. Thousands of munitions, weapons, and explosive devices will still need to be removed from the city before residents can begin to return safely to their homes. The Raqqa Civil Council and the Raqqa Internal Security Force, or RISF, is already working to remedy that issue, Dillon said. The RISF is comprised of roughly 1,600 local recruits trained by the coalition. Yesterday the RISF commander was killed after stepping on an improvised explosive device, Dillon said highlighting how dangerous the city was. Several families trying to return to Raqqa have also triggered IEDs, causing casualties, Dillon said. The liberation of Raqqa comes at the third anniversary of the creation of Combined Joint Task Force Operation Inherent Resolve, the U.S-led coalition to defeat ISIS in Iraq and Syria. SDF fighters are still operating in Deir ez-Zour province trying to liberate remaining pockets of ISIS fighters in what is called the Middle Euphrates river valley. Those operations are ongoing, Dillon said, but it is not known yet whether the SDF will commit more fighters from Raqqa to clearing further down the river valley. “We have to wait and see as things develop,” Dillon said. But, there appeared to be desire by the SDF to push further down the Euphrates, he explained. U.S. and Russian officials held a high-level meeting just over a week ago to deconflict further operations in the Middle Euphrates river valley. Russian-backed Syrian fighters are primarily operating on the western bank of the Euphrates, just a stone’s throw away from SDF militants. Officials in Baghdad estimate there are roughly 6,500 ISIS fighters left, mostly concentrated along the Middle Euphrates river valley and a small border town in Iraq known as Al Qaim.